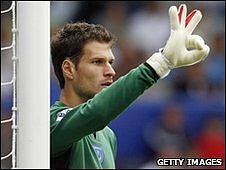 Ipswich Town's on-loan goalkeeper Asmir Begovic has been recalled by his parent club Portsmouth. The 22-year-old is needed at Fratton Park after England international David James suffered a calf injury. The Bosnia-Hercegovina international had become a popular figure at Portman Road after helping the club to a six-match unbeaten run. Begovic was six weeks into his three- month loan and is likely to be replaced by Richard Wright. Ipswich boss Roy Keane may also look for another experienced keeper before Thursday's deadline for loan deals. Begovic says he would be interested in returning to Portman Road once James has recovered from injury. He told the club website: "I'm sad to leave, to be honest. "I have a new challenge at Portsmouth but if the opportunity comes up to return to Ipswich on loan I would be very interested."